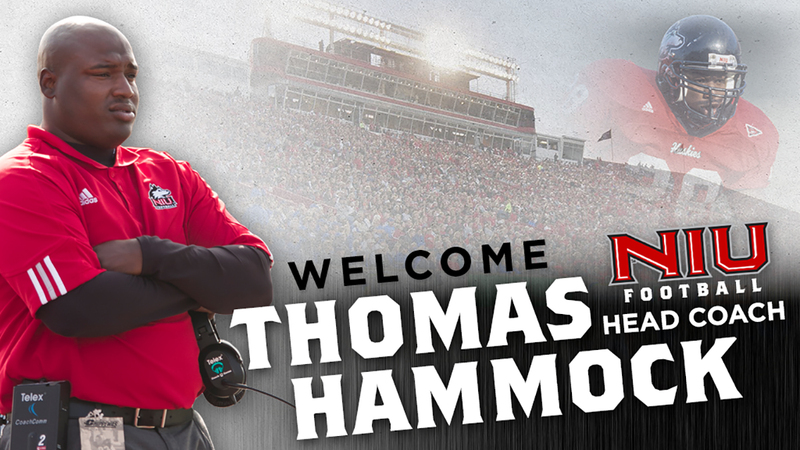 DEKALB, Ill. – Thomas Hammock, '02, a former Huskie player and assistant coach, returns home as the 23rd head coach in the history of the Northern Illinois University football program, NIU Associate Vice-President and Director of Athletics Sean T. Frazier announced on Friday. Hammock returns to NIU after spending the last five seasons as an assistant coach with the Baltimore Ravens and is the first African-American head coach in NIU football history. "This is a huge hire," said NIU Associate Vice-President and Director of Athletics Sean T. Frazier. "To be able to bring back a part of our tradition, particularly from the Novak era, and really unite all of our Huskies, and quite frankly, have someone who's iconic in our history books, is fantastic. I've known Thomas for a while, even before coming to NIU. He's always talked about NIU, The Hard Way, the tradition, the hard work, and the grit. All those things make it special to make this hire." NIU President Dr. Lisa Freeman echoed Frazier's thoughts on bringing a Huskie home. "I'm just delighted we're hiring someone who is such a true Huskie and understands the power of NIU to transform lives," Freeman said. "He wants to bring that experience to our student-athletes and all of our students. He'll make a great head coach. I can't wait to introduce him to the community." "I can't describe it," Hammock said "It's an unbelievable feeling to have the opportunity to come home to a place that I love, to the school that has meant so much to me. I can't wait to get started with the players and have a chance to put a product on the field that the alumni and fans will be proud of." In five seasons as the running backs coach with the Ravens, he helped Baltimore's rushing attack finish in the top 11 in the NFL three times, including this past season when the Ravens had the second-best rushing offense in the league, averaging 152.6 yards per game. The Ravens made the playoffs twice in Hammock's time in Baltimore. During Hammock's first season in 2014, Hammock helped revitalize the Ravens run game that had finished 30th in the NFL the prior season. The 2014 Ravens finished eighth in the NFL in rushing, averaging 126.2 yards per game, as they posted a 10-6 record and reached the AFC Divisional Round of the playoffs as a wild card. Hammock helped mentor running back Justin Forsett to his first career Pro Bowl in 2014 as he rushed for a career-high 1,266 yards, fifth-most in the NFL. Over two seasons, 2014-15, Forsett led the NFL in rushes of 20-plus yards with 22. The Ravens run game finished 11th in the league in 2017 as they averaged 116.0 yards per game. Alex Collins had a breakout season under Hammock's guidance in 2017, rushing for 973 yards while tallying 1,160 yards from scrimmage. Collins' 4.6 yards per catch ranks fourth-best among running backs in the NFL. Prior to his five seasons in Baltimore, Hammock spent three years at the University of Wisconsin, where he was the running backs coach and assistant head coach. In 2011, Hammock's first season in Madison, the Badgers ranked 11th nationally in rushing, averaging 235.6 yards per game. Hammock helped Montee Ball lead the nation in rushing yards (1,923) and tie Barry Sanders' single-season NCAA touchdown record (29). Ball was a consensus first team All-American and a Heisman Trophy finalist as the Badgers finished 11-3 and played in the Rose Bowl. The following season, Wisconsin was once again among the nation's elite rushing teams, finishing 13th in the country with 236.4 rushing yards per game. Ball became the NCAA's all-time leader in rushing touchdowns with 77 and won the Doak Walker Award as the nation's top running back, finishing with 1,830 rushing yards, as Wisconsin returned to the Rose Bowl. In 2013, Hammock's final season at Wisconsin, the Badgers set a school record with 3,689 rushing yards, finishing eighth in the nation. James White and Melvin Gordon each earned Second Team All-Big Ten honors as the duo each rushed for over 1,000 yards. Gordon was a semifinalist for both the Maxwell and Doak Walker Awards as Wisconsin finished the season with a 9-4 record. Hammock's three seasons at Wisconsin from 2011-13 was his second stint with the Badgers football program, having begun his coaching career as a graduate assistant at Wisconsin in 2003-04, helping the Badgers to appearances in the Music City Bowl (2003) and Outback Bowl (2004). The former Huskie running back returned to DeKalb as an assistant coach for Joe Novak for two seasons in 2005-06. In Hammock's first season, NIU Hall of Famer Garrett Wolfe rushed for 1,580 yards and 16 touchdowns in just nine games as NIU won the MAC West Division and appeared in the MAC Championship Game for the first time. During the 2006 campaign, Wolfe rushed for an NCAA-best 1,928 yards as the Huskies reached the Poinsettia Bowl. Hammock helped Wolfe earn All-America and First Team All-MAC honors in both 2005 and 2006, Wolfe was also the Vern Smith Leadership Award winner as the MAC's Most Valuable Player in 2006. As a player, Hammock gained 2,432 rushing yards in his NIU career (1999-2002), which still ranks 13th all-time in Huskie history. He was a two-time CoSIDA Academic All-American (2000, '01) and a two-time First Team All-MAC honoree (2000, '01). Hammock earned his bachelor's degree in marketing from NIU in 2002 and a master's in educational leadership and policy analysis from Wisconsin in 2004. He and his wife, Cheynnitha, also an NIU graduate, have a daughter, Tierra, and a son, Thomas Douglas.